Shortly after taking off from New York's LaGuardia Airport, both engines were disabled and he quickly determined that landing in the Hudson River was his only option. He successfully glided the plane to a water landing, saving all of the 155 passengers and crew members on board. 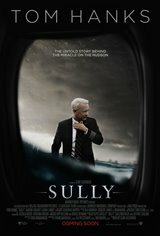 Directed by Clint Eastwood, Sully tells the story of how an ordinary American, whose work day began in a seemingly normal way, rose to the status of hero with unbridled courage and expertise in the face of panic and danger.